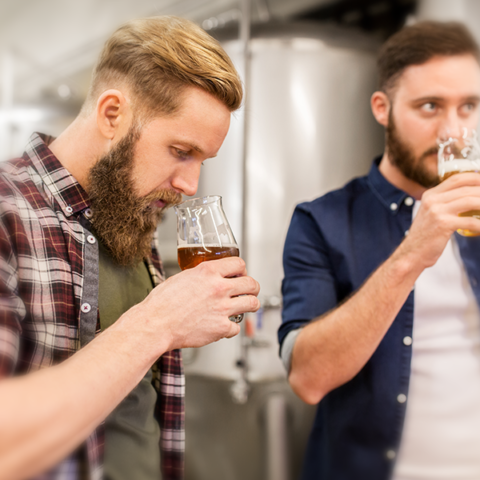 After several months of research and development in partnership with micro-breweries, the CDA teams have developed one of the most compact and versatile monoblocs on the market for Breweries. Outfitted with 2 filling nozzles and an impeller pump, this automatic filling and capping machine allows a production rate of up to 1200 bottles/hour. The automatic monoblocs can run any sizes of beer bottles from 8.5oz to 50oz and allow cold filling (3C or 37F) as well as filling at room temperature. Designed for maximum customization, the B-Hop can be easily integrated with an automatic labeling machine. Other options are also available, such as Inkjet printing or accumulation tables. Compliant to all crown caps due to a capping pressure control system managed by a manometer, the B-Hop is one of the only machine available in the market with such versatibility. CDA also designed the B-Hop to be very easy to clean in between each production. With its ultra-compact size, production speed, ease of use of cleaning the B-Hop is a very versatile monobloc with quick change over and limited tooling required. This automatic filling and capping machine is the solution for all microbreweries, breweries and brewpubs who wants to increase their production. Do you want to see the B-Hop running? Join us at the Brew Expo America! We’ll be exhibiting at the Craft Brewers Conference (CBC) – in Nasville, TN on May 1st to May 3rd at Booth#2931. B1500 : this automatic labeling machine can be integrated in an automatic filling and capping line such as the B-Hop. Up to 4 labels (label, back label, medal and neck label) on bottles with a production rate of up to 1500 BPH the B1500 is the perfect packaging solution for all microbreweries, breweries and brewpubs. To get more information about the B1500, click here! We look forward to seeing you on Booth#2931!